The Kennedy Center for Theatre and the Studio Arts is sited directly across the lawn from the recently completed Ruth and Elmer Wellin Museum, also designed by Machado Silvetti, as part of a collection of buildings around a reconstructed pond that will create a new arts quad at Hamilton and help develop connections between the two sides of campus. Porosity is a critical component of the design, with a goal of inducing movement through and around the new building to draw it fully into the campus fabric. 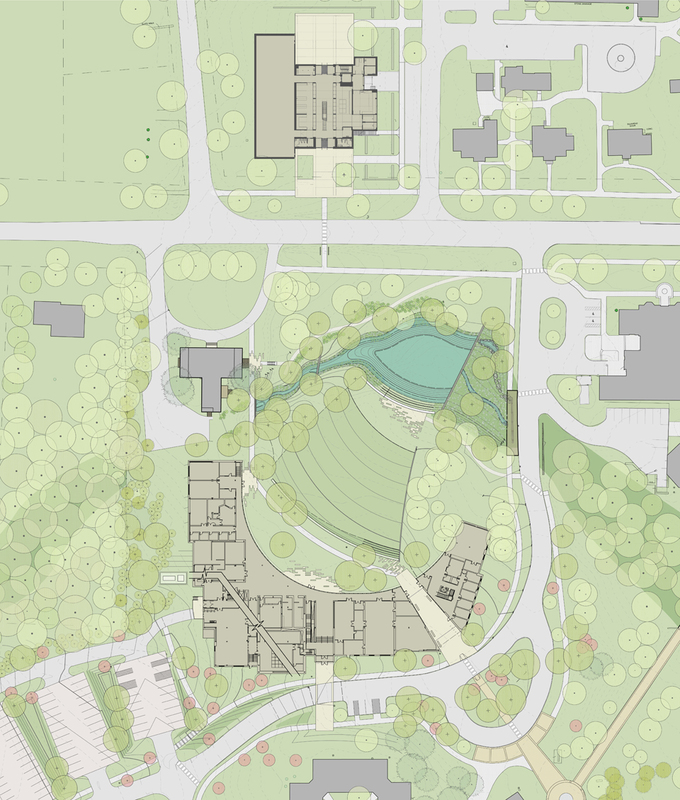 The project siting and design also carefully considers pedestrian and vehicular access from existing campus roads and walks. Theatre and the visual arts at Hamilton are integrated into the broader liberal arts curriculum, and both students and faculty from all majors and departments will use the new building. The Theatre and Studio Arts Building brings classrooms, studios, faculty offices, performance spaces and technical workshops, into one 24-hour facility to reinforce this interdisciplinary program. The building brings two-dimensional, three-dimensional, and four-dimensional art studios under the same roof in a facility with state of the art ventilation systems, controllable natural light, loading dock and freight elevator access, and classrooms and storage spaces, specially designed to accommodate Hamilton's unique visual arts curriculum. The multidisciplinary space draws students from art, theatre and music departments, as well as mathematics, social sciences, physics and others, using digital media as a bridge between diverse areas of study. Workshop and studio spaces require high ventilation rates and large quantities of fresh air. Mechanical systems are designed to provide the highest level of safety for students and faculty while taking advantage of all opportunities for energy conservation. CO2 and motion sensors, as well as manual user overrides, are used to modulate ventilation rates in response to building occupancy and actual ventilation needs. The building will utilize heat recovery units to draw energy off of exhausted air and systems are being designed to maximize benefits associated with the diversity of ventilation rates and heating and cooling needs.